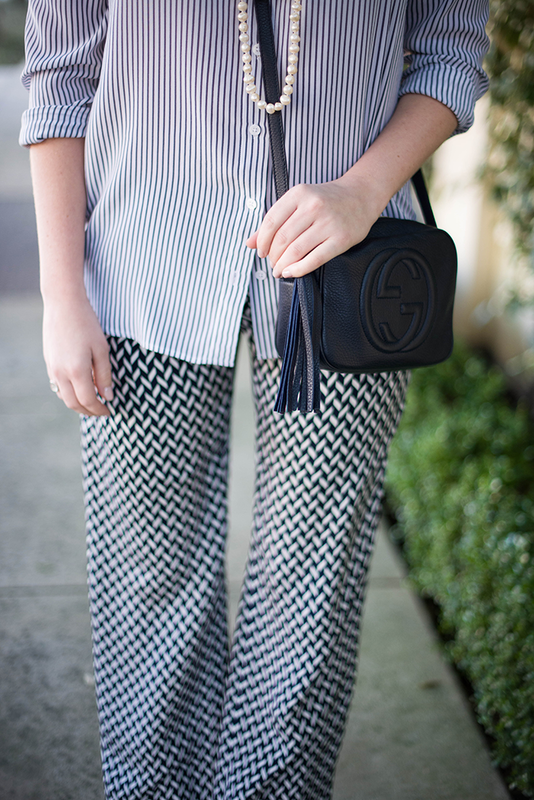 I’m quite taken by the look of mixed prints, so when I acquired this striped Equipment blouse, I knew it would be a match made in heaven for my favorite silk Theory pants. I’ve gotten so much use out of these pieces separately, but I also love them together! Pajama dressing may not be appropriate for all occasions, but damn it, it’s comfortable! On a completely different note, I’m thinking about switching from Nikon to Canon, so I’ll likely be selling my Nikon D600 and all of the lenses that go with it (I have the 35mm f1.8, 50mm f1.4 and an amazing travel/zoom lens). It’s an incredible camera, I just have a specific look in mind that Canon seems to do better. All of the photos on my blog have been taken with the D600 on a 50 mm lens, so if you’re looking for a very high-quality, professional piece of equipment but not looking to pay the full price, email me! 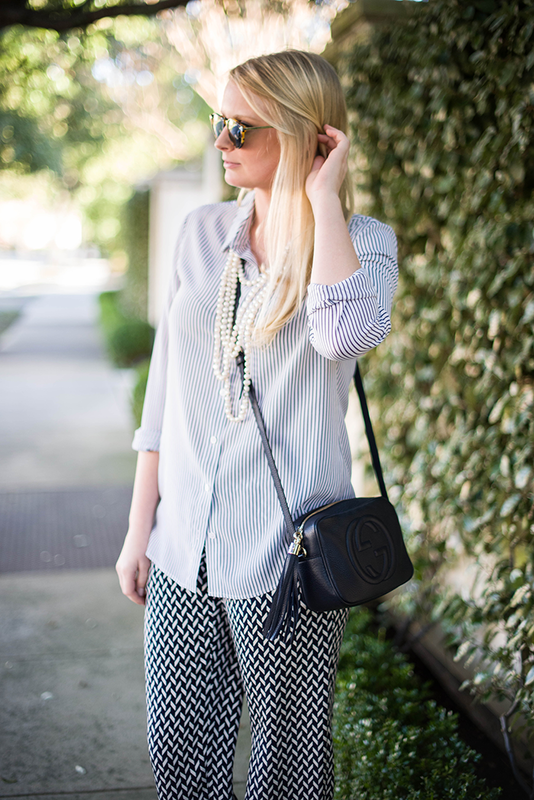 Love this combo and the pearls are a great addition. I am having a camera dilemma as well, I am looking forward to see the different between your photos so please feel free to let us know how you like the canon. Love it! Wish this color collar was still available, it’s stunning! Seriously I am totally crushing on those pants! Loving the mixed prints and that fur collar is gorg! Every time you wear that fur collar I get so jealous! It’s gorgeous! Love the blouse and long pearls. I love the pattern play you’ve got going! I have those Theory pants and LOVE them. those pants seem so comfortable!! I love them and perfectly paired with that blouse. I may be interested in one of your lenses. I will email you. I love the two patterns together! You always look so chic! Go for the Canon. I’ve always used Canon and I recently acquired Canon Rebel SL1. It’s lightweight and take phenomenal photos. I’m still learning it but I like it! 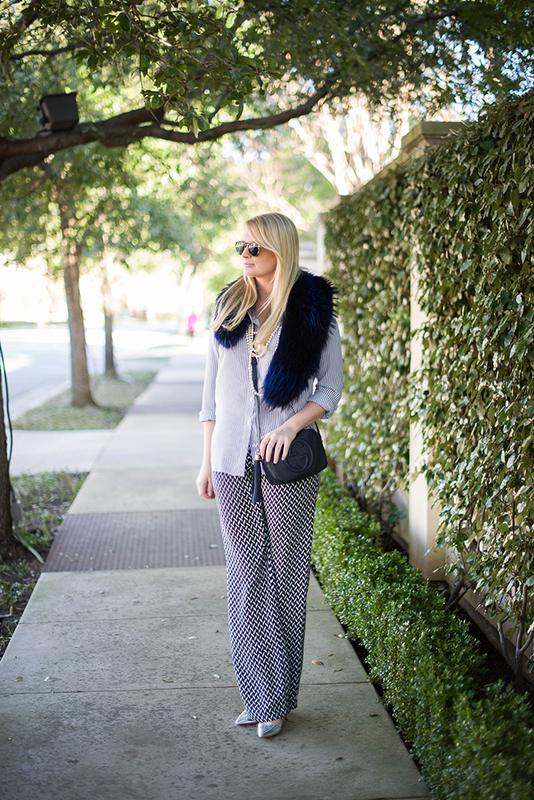 Fur collar is so cool and I really love the pants! This is gorgeous. What a classy & ultra luxurious look. Love that blouse to pieces! Love the pattern mixing, the pearls are a great touch. Looking gorgeous as always! Love those pants! Hello fabulous! Love that fur collar! oh my, those pants!! love. You look so polished and cozy! I love it! Love those pants! The prefect transition piece for spring! You know that delicate balance between looking super chic while simultaneously coming across as though you weren’t trying to look super chic at all? Yeah, this outfit achieves that perfectly. Love this outfit! The mix of prints is great and those pearls are awesome. 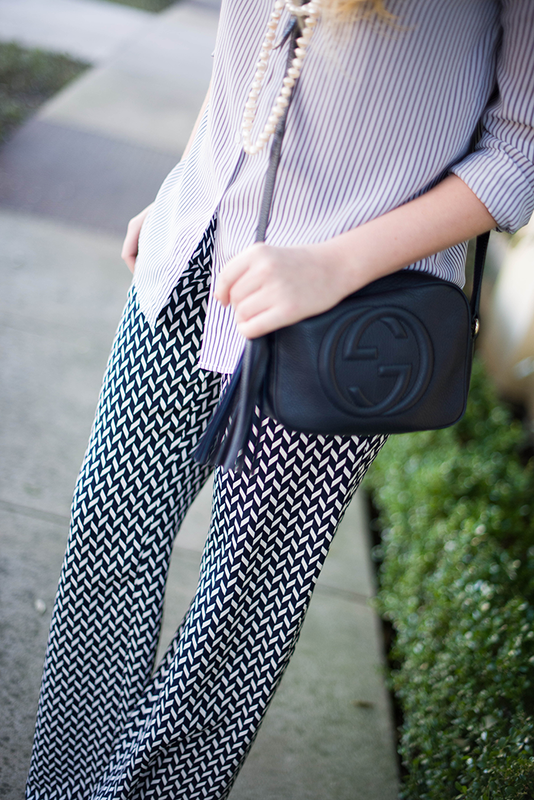 Love those printed pants and the print mix of the outfit- fabulous mix! this is one of my fav looks on you ! you style each piece so well !